I don’t like eating the same thing for breakfast every day. My husband ate frozen waffles for breakfast pretty much every day for two years straight – no joke! Not me, though. Every couple of weeks I like to switch it up so I have something to look forward to in the morning. 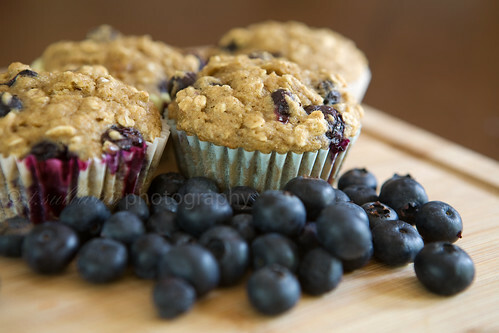 A little while ago I came across a recipe for Oatmeal Blueberry Applesauce Muffins on Joy the Baker’s website. I like oatmeal, I like applesauce, I like blueberries, and I love muffins, so she had me with the title. 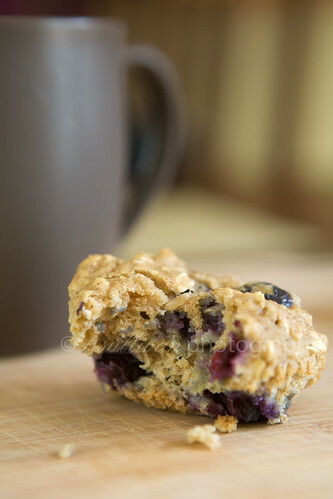 As I read about the recipe, though, I realized these weren’t your ordinary blueberry muffins. First of all, they’re low-fat. Second, they’re made with whole grains. As much as I loved sound of the title ingredients together, I started to have doubts. Low-fat AND whole grain? Were these going to end up flavorless, bland hockey pucks? I have to say, Joy, I’m sorry I ever doubted your recipe. I LOVED these muffins! Seriously. I have not shut up about them since I made them. I’ve told my mom, my boss and my best friend about them. And I’ve since eaten all but one of them myself. 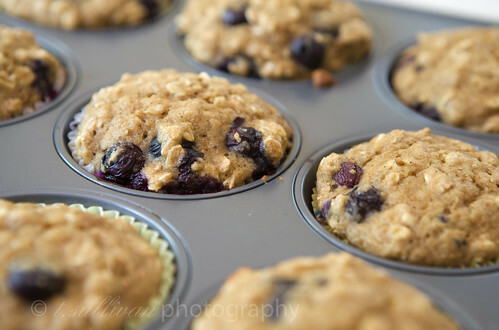 The whole grains give the muffins a hearty, satisfying taste and the blueberries are the perfect burst of sweetness. The applesauce keeps them moist, and oh, the cinnamon. The cinnamon was my favorite part of this recipe. When they’re warm, the aroma of the cinnamon hits your nose and it’s like that feeling when you first sink into a hot tub, instantly warm and relaxing. I loved them so much, I just might eat them for breakfast every day for the next two years. In a large bowl whisk together flour, oats, baking powder, baking soda, salt and cinnamon. Combine applesauce, buttermilk, sugar, oil and egg in a medium bowl. Make a well in dry ingredients and add applesauce mixture, stirring until just moist. (Don’t over mix them! The batter will be thicker than your average muffin batter.) Carefully fold in blueberries. Spoon the batter into muffin cups. Bake at 375°F for 16-18 minutes. Great recipe, healthy ingredients and very attractive pictures! Your muffins turned out just lovely! I’m so glad you like the recipe. You’re totally right, definitely splurge with two or three of these for breakfast. They’re that good! I have everything in the house BUT the buttermilk. I may need to go get that so i can try these out. Considering I just picked up 3 containers of blueberries for no reason whatsoever… this might be the perfect use for them! I hope you got rid of that bitter taste ! I just made these this morning- delicious! Thank you for sharing this recipe. I went to the original blog and bookmarked that too. Funny that you say “go ahead- eat a second one” because I ate at least three in one sitting. For a health group activity I’m participating in, we have to find a healthy recipe to share with everyone. I’m going to share this muffin recipe. Sounds perfect – and delicious!